A basketball hoop should be a staple in everyone’s home. When you’ve got a good one, it will bring decades of joy for you and your children. Whether you’re looking to hone your own skills or just want something fun to play with, then you need an in-ground basketball hoop. This is a specific type of basketball hoop as it’s not portable. While you lose the ability to move it around, you gain some serious positives as well. Mainly, it’s far sturdier and more secure as the base is fixed into the ground. So, they tend to last a lot longer, bringing excellent value for money. The Goalrilla FT Series is a seriously quality basketball hoop. Instantly, there’s something to like in that you have multiple backboard sizes to choose from; 54. 60, and 72 inches. This means that you can almost pick and choose how much you’re willing to pay for this in-ground hoop, so you could save money with the smallest option. Plus, the backboards themselves are made from tempered glass to give an almost pro-style look and finish. Structurally, we’re looking at a black anodized frame that makes this product look as though it’s straight out of an NBA arena. The in-ground anchor system is mightily impressive, and you can even unbolt it to move the hoop if you wish! You can also adjust the height between 7.5 and 10 feet, making it suitable for kids and adults. Perhaps the best feature of all is the rim, which flexes under pressure to give an even more professional feel to things. 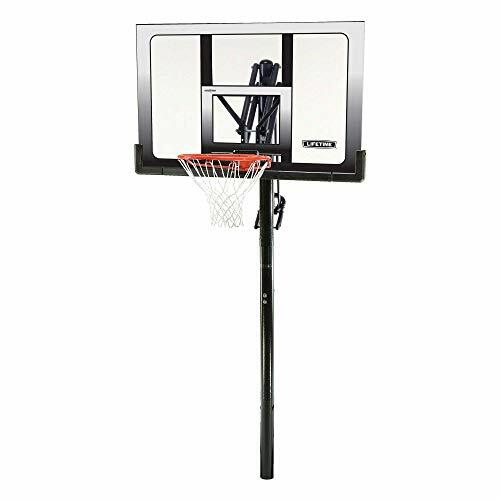 Again, this offering from Spalding gives you the same three backboard sizes to choose from, and you also have the benefit of an adjustable height from 7 to 10 feet. These are key features to look for when selecting the best in-ground basketball hoop as you want to have a degree of flexibility. The tempered glass backboard offers some genuinely amazing rebounding as it absorbs all force from a ball and just throws it back out. This in-ground system uses a J-bolt anchoring system to make it very sturdy and brilliantly durable as well. But, the real standout features of the Spalding 888 Series is that it’s built for outdoor play. The flex breakaway rim is very tough, and it has a net that can last through all weather conditions. Anyone with an outdoor basketball hoop can tell you that the net is always the first thing to go! You also get a lovely heavy-duty pole pad that fits around the sturdy pole at the bottom, which is brilliant as it keeps everyone safe and prevents instances where you may run into the pole and hurt yourself. Board size: 60" x 38"
The Silverback 60” In-Ground Basketball Hoop may only offer two backboard sizes – 54 and 60 inches – but it comes in at around about a mid-range price compared to other products. The previous two are definitely in the high premium section, so this offers something for people with stricter budgets. Plus, you still get some great features that make it perfect for home use. With the anchor mounting system, you get the real strength of concrete and a basketball hoop that won’t budge under pressure. Plus, you can unbolt it easily and move the goal around, which some people find very useful. 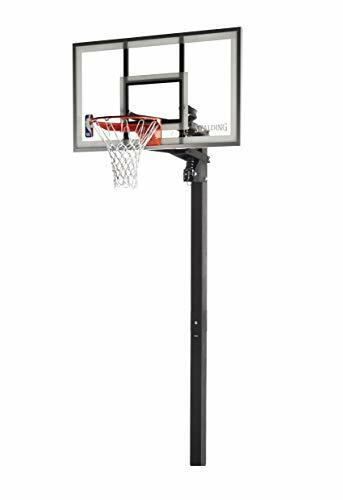 There’s an easy-to-use handle that means you can quickly adjust the height from 7.5 to 10 feet, and the backboard is made from reinforced tempered glass, offering extreme durability. To add to this, there’s a safety pad on the bottom corners of the backboard to prevent any injuries – and you also get a pole pad as well. So, this is a product that really takes care of any safety worries! The rim flexes under pressure and feels very professional, meaning you get a premium-quality hoop for your home. The main reason this product is contention to be the best in-ground basketball hoop is that it’s very affordable. You’ll find it in the lowest tier of prices, which allows people to buy a good quality hoop for their home, without spending too much. Not only that, but it represents excellent value for money as well. The tempered glass backboard is mightily impressive and provides really good rebounds when you’re playing. Add to this the rim – it’s one of the best and most flexible around, meaning all the adults out there will have fun dunking for ages! You still get two backboard sizes to choose from as well; 54 and 60 inches, meaning you can save even more if you opt for the smallest one. 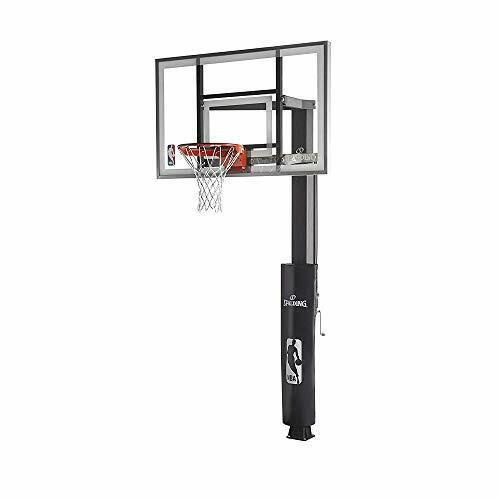 The Spalding NBA In-Ground Basketball System also offers a square steel pole, which provides extra durability and more structural soundness that a circular pole. The installation can be a bit tricky, but most customers end up highly satisfied with the results. As you would expect from one of the best in-ground basketball hoops, you can adjust the height between 7.5 and 10 feet as well. Perhaps the only downside is that it doesn’t have the same top-level look and feel as other options, but you are paying a lot less. Also, there aren’t any protective pads anywhere, so you have to buy them yourself. Lastly, we have the Lifetime 71281, which is the only product that doesn’t offer different backboard sizes. 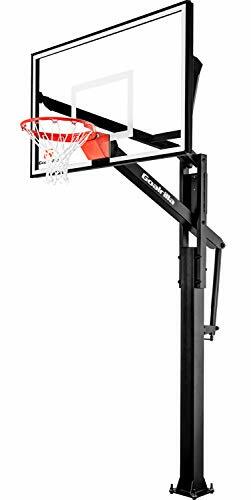 However, it has so many impressive points that it just can’t be ignored and must at least be considered as a contender for the best in-ground basketball hoop. Right away, your attention turns to the backboard. Unlike all other products, this one isn’t made with tempered glass. Instead, it uses High-Density Polyethylene to provide serious strength. The result is a backboard that’s virtually shatterproof and will last for an extremely long time. It’s 52 inches in size, which might be small for some adults, but it’s ideal for most people looking to enjoy a basketball hoop in their front or back yard. Lifetime has given this product a Slam-It Rim, which allows you to do just what it says; slam the ball in. It responds very well to all kinds of pressure, so there’s never the risk of it breaking off after a dunk. Also, it has a weather-resistant nylon net, which just adds to the durability of the product. Speaking of which, the whole system is given UV protection as the steel pole is powder-coated. This also makes it resistant to all weather types and ensures there’s no rust either. The pole itself is rounded and split into 3 pieces, but there’s a really intriguing friction-weld joint that really keeps everything firmly in place and reduces the chances of movement. Of course, the height is adjustable, and you have a Power Lift mechanism that means you only have to squeeze the handle to adjust it to any height between 7.5 and 10 feet. Without a doubt, these are the top products to consider for anyone searching for the best in-ground basketball hoop. With these options, you can bring an almost professional feel to your home basketball set up. What’s excellent about all of them is that they can be height adjusted to suit adults or children. I’ll also add that it’s essential to have protective padding on your hoop, so if you choose an option without this, then make sure you add it on as an extra purchase. There are different products that appeal to different people with different budgets. My advice is to have another read through the reviews and think about the features that are essential to you. Do you have a strict budget? Do you want the ability to unbolt the hoop at a later date? Are you concerned about weather resistance? Make a list of your essential requirements, and you’ll soon buy the best in-ground basketball hoop for your needs!